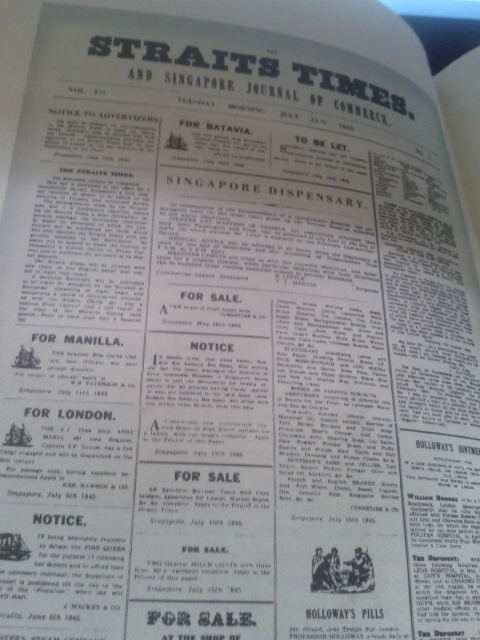 The Straits Times is marking its 168th anniversary today with a cornucopia of gifts. Lucky readers stand to win among other things a trip for two to London while another lucky pair will go to Munich to test-drive the latest BMW. The birthday bash behoves a golden goose of a newspaper which as the only English-language daily newspaper of record in Singapore commands an average daily circulation of 389,700, according to its parent, Singapore Press Holdings. The big fat newspaper now, often running to more than 100 pages, is very different from the slim inaugural issue which had only advertisements on the front page (see below). 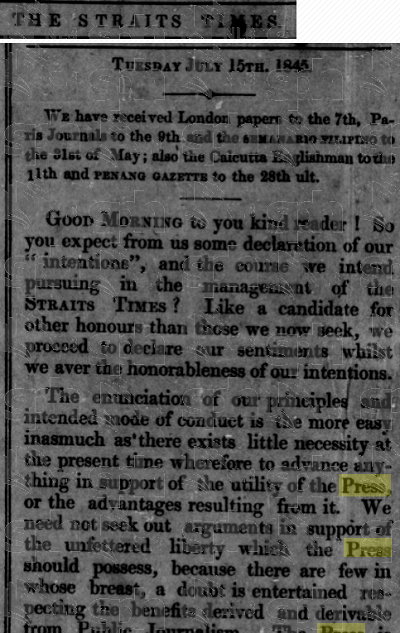 The first issue of the Straits Times and Singapore Journal of Commerce appeared on the morning of July 15, 1845, published from No 7 Commercial Square. It was a weekly paper of eight folio pages, printed with new type and on “fine English paper”. You can read the whole editorial online on NewspaperSG maintained by the National Library.